Two new highly anticipated flavors are here! 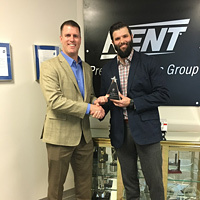 Jason Gregory has accepted the position of President of Kent Precision Foods Group. Now, for a limited time only, Land O’Lakes Cocoa Classics is bringing together delicious cookie flavors into one delightful cup of hot cocoa. The Thick-It® Clear Advantage line now includes Single Serve Packets in both honey and nectar consistency. The Foothill Farms line now includes Hatch-Style Green Enchilada Sauce Mix with Serrano Chiles. Bass Pro Shops has identified select stores that will serve as a test market for Sqwincher electrolyte hydration products. As a leader in food and ag community, Land O’Lakes is working to raise awareness of the farm-to-fork business model and the cooperative’s position as an innovative leader in modern agriculture. Announcing a Reformulated DOLE® Mango Soft Serve! We are excited to bring you the refreshed DOLE® Mango Soft Serve! A thickened diet is crucial to wellness for the more than 18 million Americans who struggle with dysphagia. For the 6th consecutive year, KPFG has achieved the prestigious honor of receiving the Dot Service and Quality Award. Pumpkin Spice has become one of the most popular flavors on the market between September and December. Sqwincher Sqweeze Pops are available in five great-tasting flavors. Thick-It® is expanding its line to allow for greater bioavailability of thickened medications and supplements.